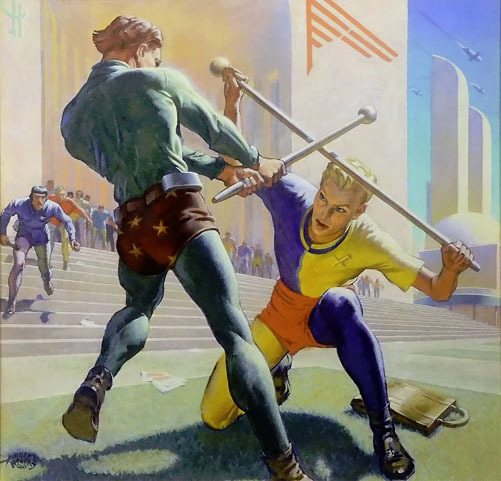 Doug Ellis recently purchased this painting by Hubert Rogers for the cover of Astounding magazine in April of 1941, and he’s not only shared that with us over at Black Gate but provided several bits of correspondence between the artist and two of the authors he illustrated. Also, it’s about time that starry briefs made a fashion comeback. 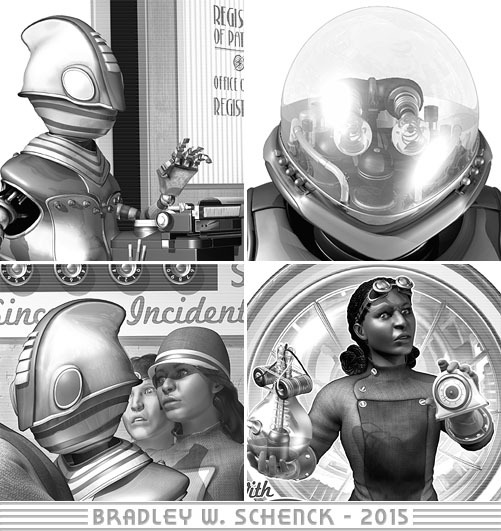 Here are a few little graphic non sequiturs; they’re just tiny cropped bits of some things that I’m working on. Because I felt like almost showing them. So, here’s the deal: in an apparent commemoration of Pearl Harbor Day (coming up on Monday! 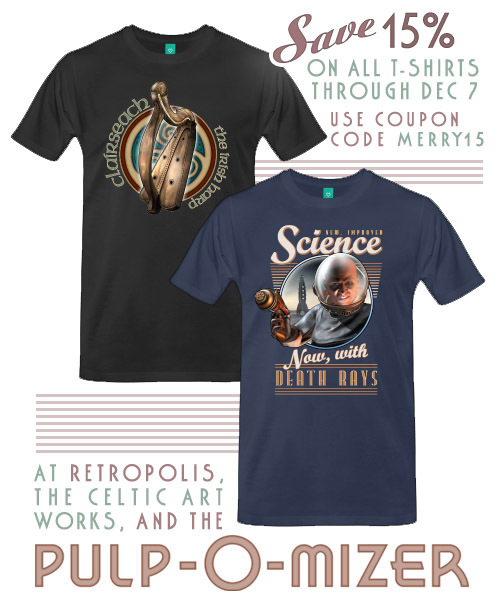 ), you can save 15% on any T-shirt order from The Retropolis Transit Authority, The Celtic Art Works, or the Pulp-O-Mizer. The sale runs through Monday the 7th. All you have to do is enter the coupon code MERRY15 during your checkout. And since the sale is running on all my T-shirts, you can combine a whole bunch of shirts from all three of those places and slash a mind-melting 15% off the whole order. I’d like that; in fact, I wish you’d consider just getting one of everything. But the actual real-world beauty of this sale is that there is no minimum order. You can get the same reduced price on a single shirt, if you like. But, you know, consider that one of everything idea anyway. You could cover a heck of a lot of torsos that way, believe you me. But say you’re not shopping at one of those fine web sites because you do all your online shopping at Amazon? Well. 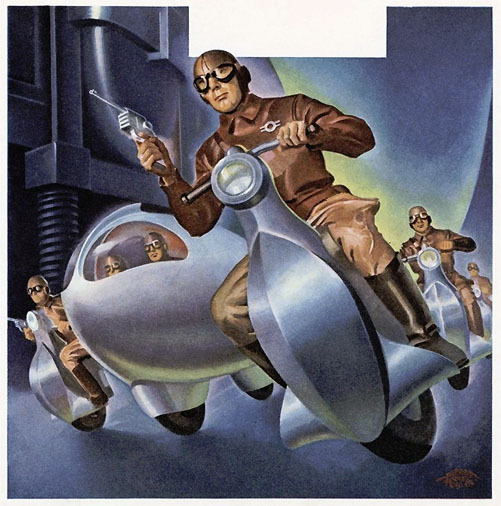 If you happen to be shopping at Amazon, and if maybe you just need to add a little something to get free shipping… you can take advantage of my ongoing Amazon experiment with a selection of Retropolis Transit T-shirts over there. They’re not on sale, but those (slightly lighter) shirts are already priced lower than the ones I sell myself. Yeah, that’s the ticket. You should probably get every one of those, too.